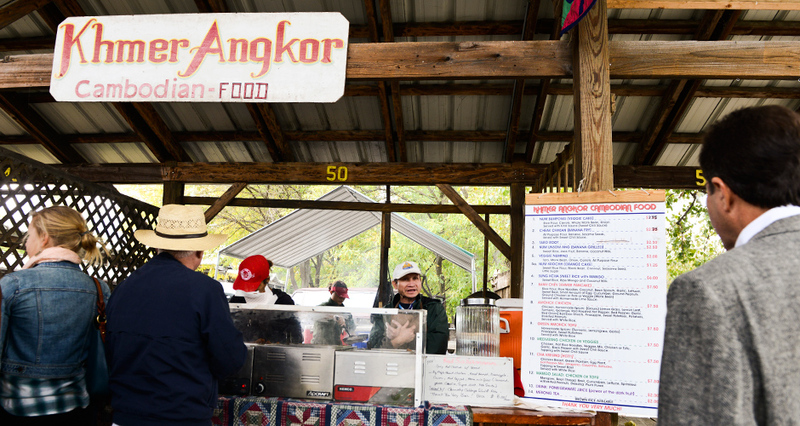 The Khmer Angkor Cambodian Food stand at the Ithaca Farmers Market does not have a sign declaring its food "fresh, seasonal, local." It doesn't need to. Often, when asked about the greatest meal we’ve had recently, our minds wander to lavish and expensive dining experiences—at least at first. 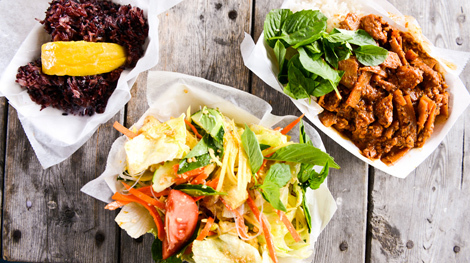 But then we make space for other memories: that exemplary noodle shop in Queens, a taco truck in Boyle Heights, or a street vendor serving a regional cuisine you’d never find at a sit-down restaurant. 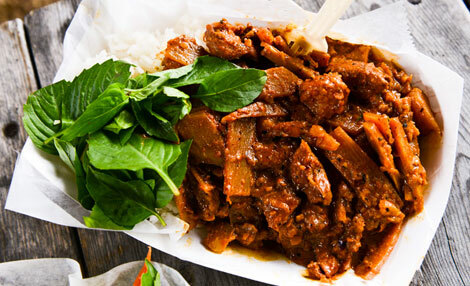 Anthony Bourdain has said it a million times on his programs, but it bears repeating: a $6 plate of curry and rice can be much more satisfying—and memorable—than a $75 dinner at whatever hyped restaurant the fooderati says you “need to try” this month. 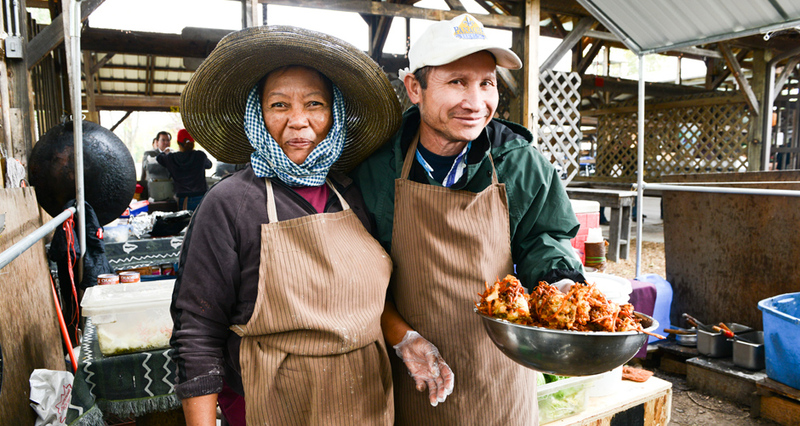 The most memorable meal of my summer was cooked by Marin and Bong Sen, the owners of Khmer Angkor, a tiny stall at the Ithaca Farmers Market in upstate New York. 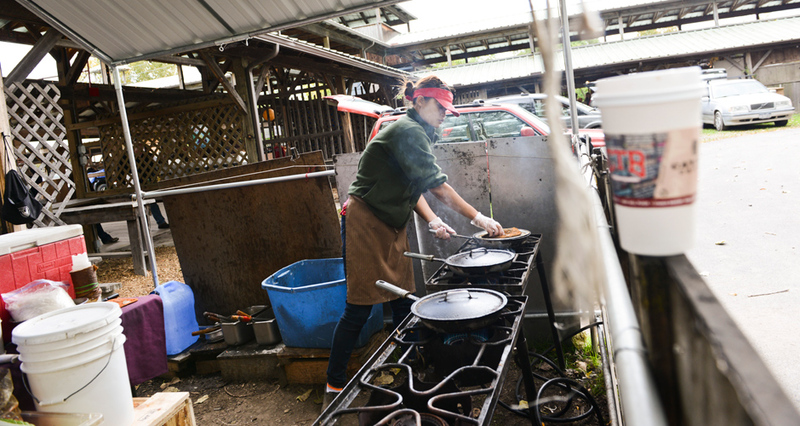 In her makeshift outdoor kitchen next to Cayuga Lake, Marin presides over cast-iron woks the size of big rig tires, balanced atop stoves fueled by mobile propane burners. 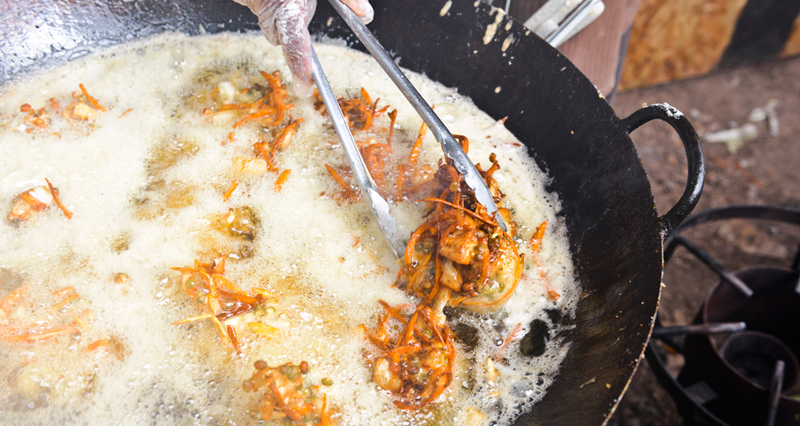 One moment, she’s patiently stirring a curry laced with chilies and lemongrass (she grows many of the ingredients she uses in her garden); the next, she’s deep-frying veggie cakes filled with mung bean, onion, carrot, and peas. I am no stranger to Marin and Bong’s cooking. I went to college for four years in Ithaca, and made countless visits to Khmer Angkor. You could say I was mildly addicted to it. When I was a bright-eyed 20 year old, I knew this cooking was great, but it took a return visit last month to contextualize just how great. 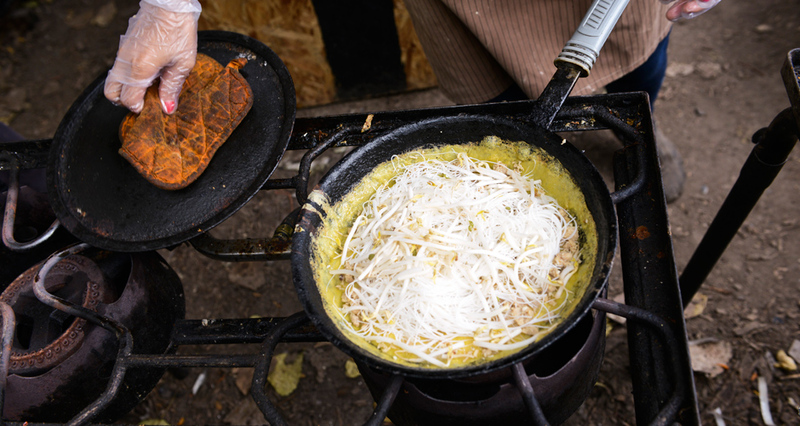 Take the Khmer pancake (banh chev): Marin makes a rice flour and egg pancake—like a crepe, only thicker and crispier around the edges—and fills it with rice noodles, shredded coconut, bean sprouts, roasted peanuts, sweet basil, lettuce, and either ground chicken, pork, or mung bean. 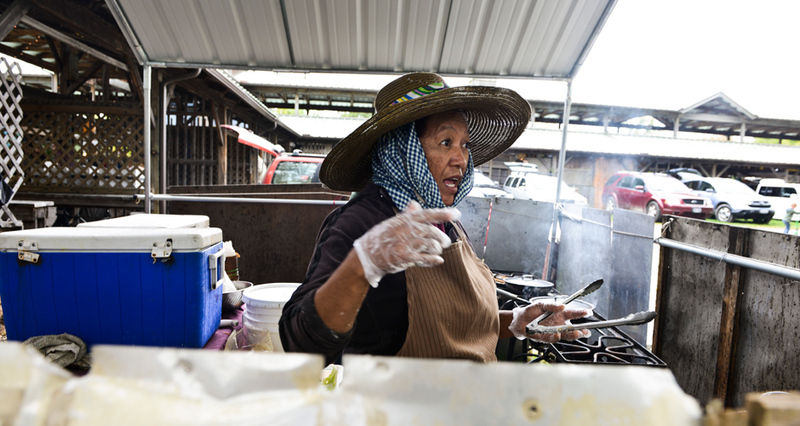 She tops the enormous pancake with more crushed peanuts and a deep, smoky, reddish-black chili sauce (like everything at Khmer Angkor, the hot sauce is homemade). 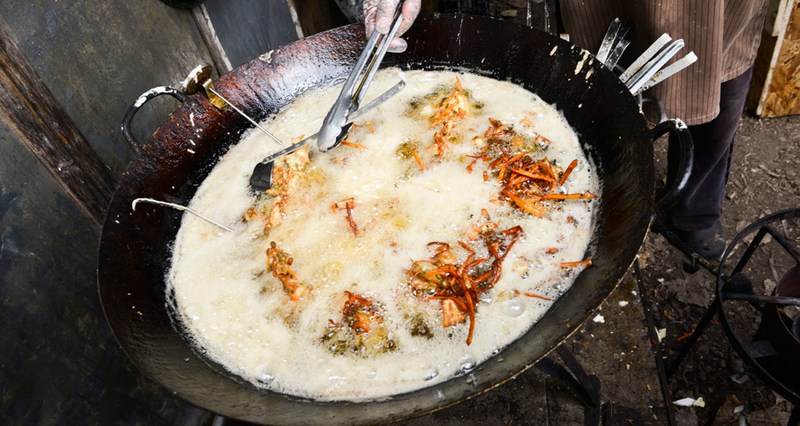 If this were served in NYC—say, at a Cambodian approximation of Pok Pok or Uncle Boons—there’d be an “anatomy of” profiling the dish in NY Mag within a month or two. 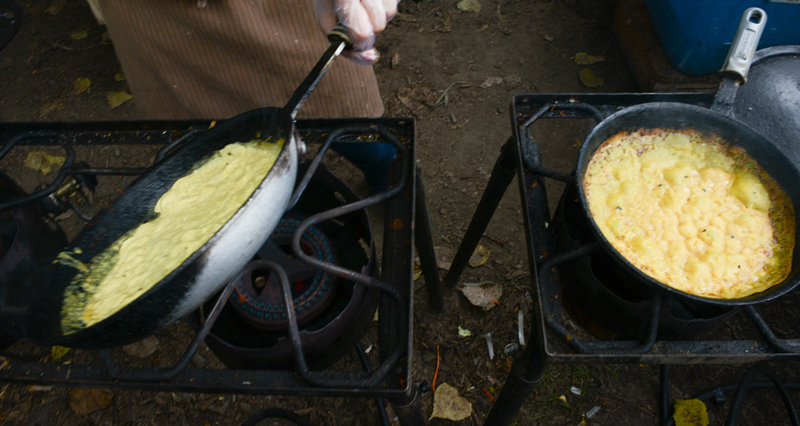 I often wondered what brought Marin and Bong to Ithaca from Cambodia, and how Marin learned to cook. When I visited in September, free now from my college-era shyness, I was able to inquire about Bong and Marin Sen’s remarkable story. They endured and survived the bloody Khmer Rouge regime during the mid- and late-1970s. In 1982, the couple escaped from the border to Thailand, then came to the United States as refugees with their two young children. With very few possessions, Bong and Marin started their lives over with the help of a Baptist Church in Ithaca. 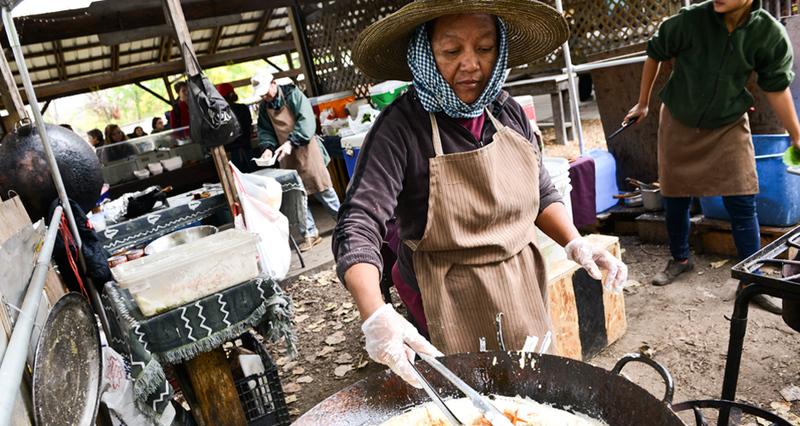 Marin, whose mother owned a restaurant in Cambodia, took cooking classes at the local BOCES (Board of Cooperative Educational Services) and received a degree in culinary arts. Bong attended classes at a local community college and studied to become a mechanical engineer. 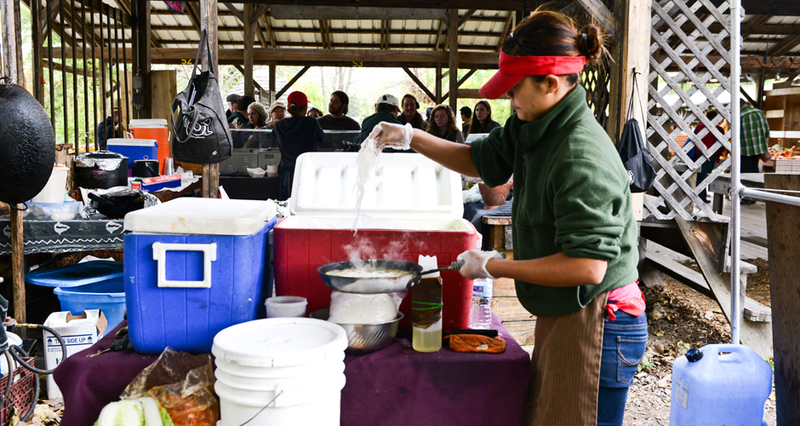 When you sit at the edge of a dock on Cayuga Lake, with a plate of Amohck chicken curry in your lap, it becomes clear why you’ve forgotten the dime-a-dozen “nouveau Southern” and “new-Nordic” restaurants of New York City. For 25 years, Marin worked for Cornell University Dining at the Statler School of Hotel Administration, where I attended undergrad. Did she restock the Romaine lettuce and Craisins at the salad bar I used to frequent, and I never even noticed her? Quite possibly. 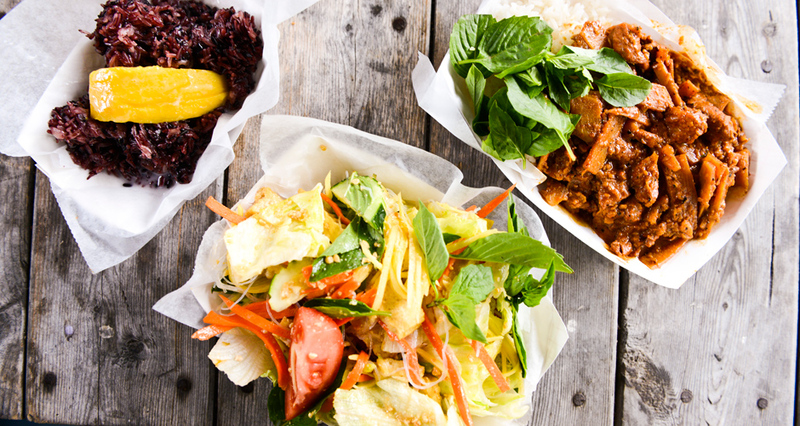 Marin also worked at other restaurants in Ithaca, including the now-defunct Thai Cuisine, as well as a French spot downtown. “I learned more and more, and researched more and more, until I had my own flavors,” she told me. In the summer of 2001, the Sens set up their stall at the Farmers Market—it’s been going strong for 14 years. The Khmer Angkor stand does not have a sign hanging out front, declaring its food “fresh, seasonal, local.” Marin gets ingredients directly from her garden—she’s installing a greenhouse so she can grow Kaffir limes, lemongrass, and basil year-round; she gets other necessities from neighboring stands at the farmers’ market. 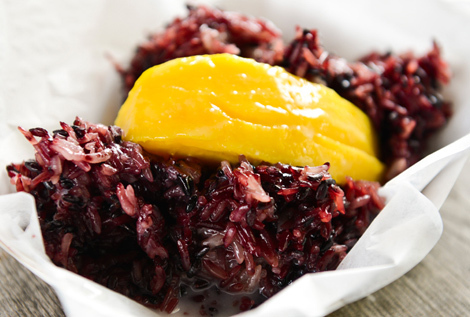 Marin’s sticky rice with mango and thickened, sweetened coconut milk is comforting and addictive; her “Amohck” chicken—a type of thick curry served over sticky rice—gives off a perfume of lemongrass, citrus leaf, turmeric, galangal, and roasted chilies. I want to bathe in it. I spent the last two years as a food writer in NYC. 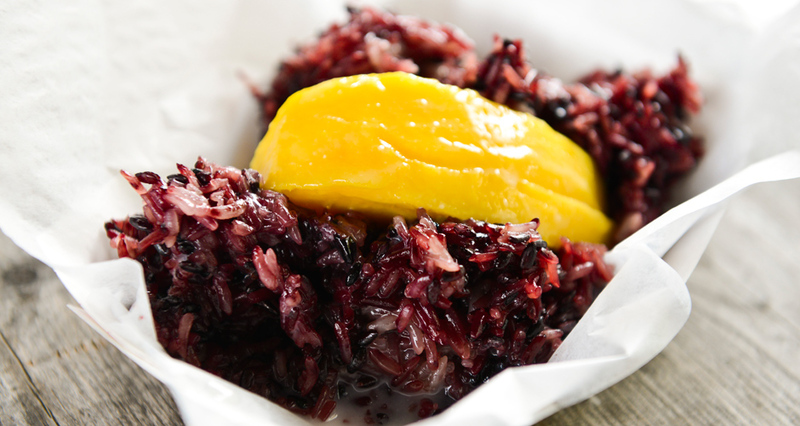 I ate at most of the hot spots, and made my way through the menus at countless “Eater 38″ establishments. Much of the time, I came away from these hyped-up dining experiences fatigued from salt, fat, and convention. That isn’t to say I wasn’t wowed from time to time; dishes like rotisserie beets at Narcissa, simple baby squid at Diner, and the omakase at Neta will always stay with me as beautiful food memories. But Marin’s cooking touched me. It was personal, and the atmosphere it was served in was perfect. The ingredients were fresh and cared for. 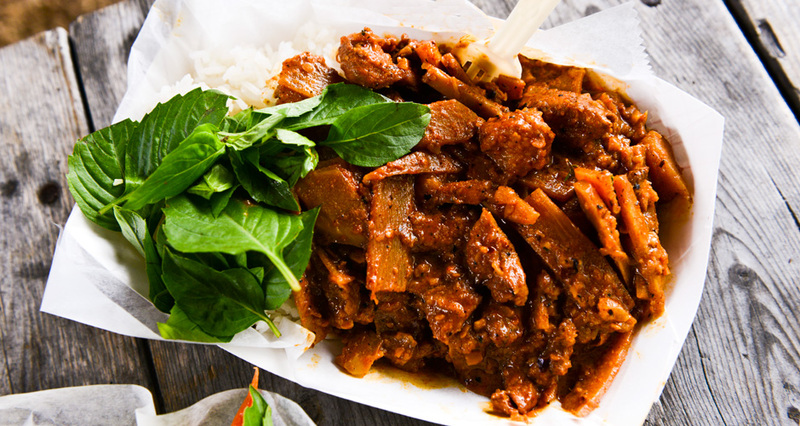 When you sit at the edge of a dock on Cayuga Lake, with a plate of Amohck chicken curry in your lap, it becomes clear why you’ve forgotten the dime-a-dozen “nouveau Southern” and “new-Nordic” restaurants of New York City. Maybe I’m just jaded, maybe my tastes are too simple—all I know is, my mind has room for only so many food experiences, and Marin Sen’s cooking will always stay with me. 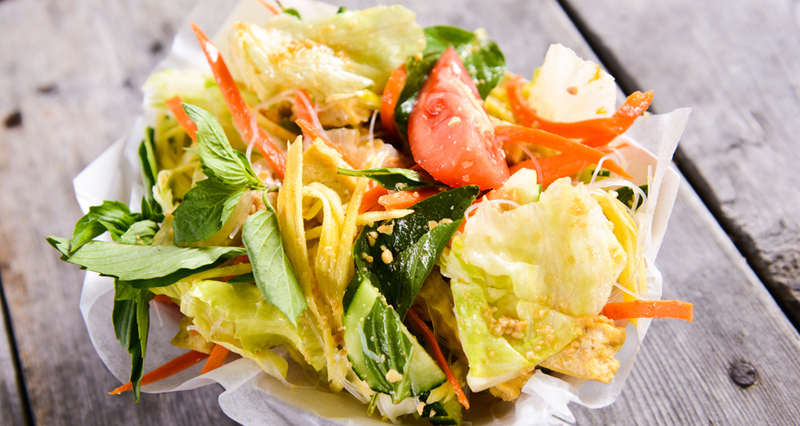 Mango salad: chicken or homemade tofu with julienned mangoes, bean thread, basil, cucumbers, lettuce, and plum dressing. Garnished with crushed roasted peanuts. Num bumping (veggie cake): Rice flour, carrots, peas, whole mung beans, and onion. Served with sweet chili sauce. Marin's daughter makes the Khmer pancake. 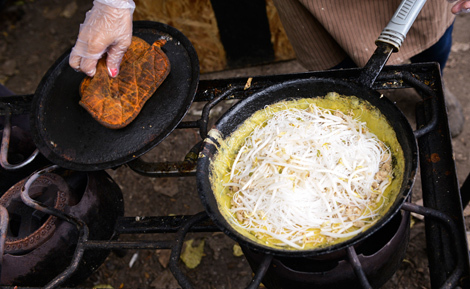 The rice-flour pancake is filled with rice noodles, coconut, bean sprouts, garlic, lettuce, sweet basil, cucumber, peanuts, and either ground chicken, pork, or mung beans. Bong Sen runs the "front of house" at Khmer Angkor. 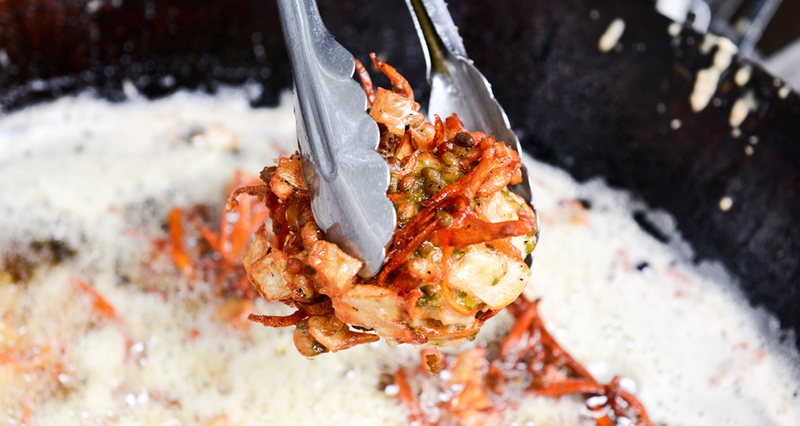 Marin fries num bumping in a wok the size of a big rig tire.